Play the latest online slots game today! 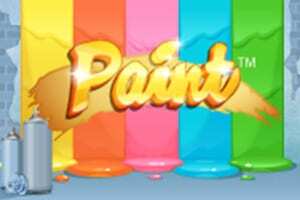 Paint is an aesthetically pleasing artist-themed video slot from the creative artists at Iron Dog Studio. The colours of the reels are vibrant as well as being textured, complimenting the choice of artist accouterments as premium symbols. Although the reels are in an orthodox five-reel, three-row configuration, the symbols disappear and emerge through a gloopy paint soup rather than spinning into view. The game has a great bonus feature and with a maximum payout of 750,000 EUR, winners could afford to start their own collection of classics. As a part of the 1X2 Gaming, Iron Dog Studio is a developer that punches well above it weight with a distinctive style that shines in their video slot designs. Despite beginning in 2017, this super busy studio has already built up an enviable stable of games including Gifts of Ostara, Treasure of Horus and Cherry Blast. As well as experimenting with bonus rounds features, Iron Dog Studio also maintains an interest in traditional casino games including Keno and roulette. The studio is also known for working closely with casino operators to ensure both customer and client satisfaction. This is just one of many amazing games from this developer, go play our new slot games here. 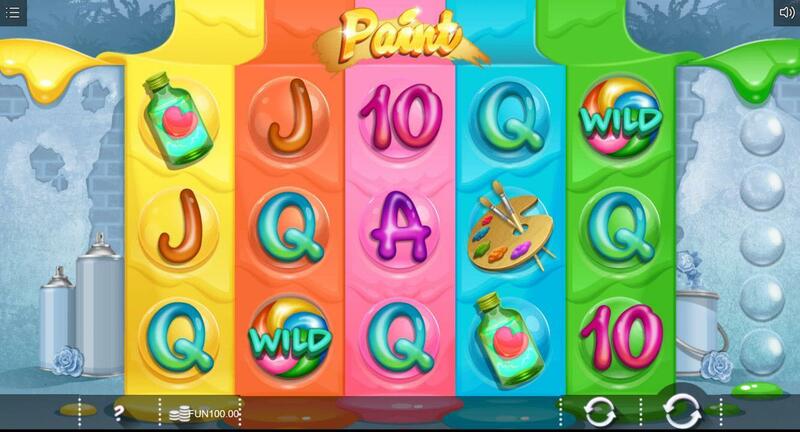 As a paint-themed game, Paint really appeals to the eye with bold primary colours and textured reels. Lower value symbols include 10, J and Q, while premium symbols are typical calling cards of the artiste including a palette and brushes and a pot of paint. Watch out for the multi-coloured wild paint swirl which substitutes for all symbols. Visit our guide to selecting top slots here. Free Spins: Once you have filled your gold symbol meter with five gold paint sponges you will be awarded five free spins. 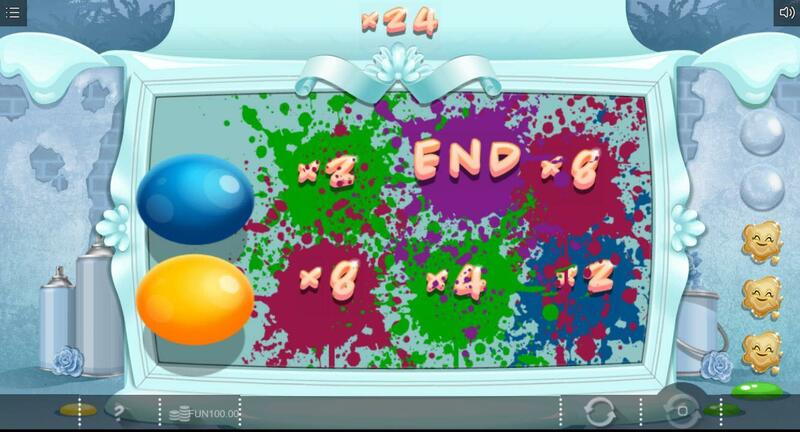 Different coloured paint characters can appear throughout your free spins, awarding different multipliers and boosting wins. Balloon Bonus: Spin three or more picture frame bonus symbols on a win line to trigger the Balloon Bonus. Four or Five Bonus symbols adds a x2 and x3 multiplier respectively. Now choose which balloons to burst and claim your cash prize! Iron Dog Studio have taken the lead in ensuring all of their games are optimized for mobile use so that you can rack up wins on the move or at home.